Unaffiliated candidate Marsha Holland greets voters during Torrey's Apple Days parade in July. Letting voters know who she is and what she stands for is key in the legislative District 73 race against a well-known, Republican opponent. He’s a Republican candidate with a criminal conviction and name recognition that make him a local hero. She’s a political novice who’s raised four times as much campaign cash while running without any political party affiliation. Together, Phil Lyman, a San Juan County Commissioner and sixth-generation Utahn, and Marsha Holland, a historian and dogged campaigner, are making the race for House District 73 one of the most interesting state legislative contests of 2018. As the two candidates vie to represent a vast expanse of southern Utah, what happens in this race hinges on whether voters stick to their GOP tradition or shift to core political issues like jobs, transportation and health care. Both hope to win the seat that’s opening with the retirement of Republican Mike Noel after 16 years. Following his federal conviction for trespass and conspiracy for his role in an ATV protest ride in Recapture Canyon that some voters see as a badge of honor, Lyman has been reserved in his campaigning. Holland, whose base is in Tropic, a tiny town in the shadow of Bryce Canyon National Park, has logged over 10,000 miles campaigning. The candidates have taken distinctly different approaches in their campaigns, prompting the question: Is it a foregone conclusion that the Republican will win in rural Utah? That’s not what Holland thinks. In a recent telephone interview, she described how rural Utah is weary of Culture War politics. And that’s why, even though she was a registered Republican for years, she opted against running under any party’s banner. She said lawmakers representing the residents of southern Utah have focused so much on fighting philosophical battles that bread-and-butter concerns have been neglected. Holland, like her opponent, raises the issue of public lands in her platform. But she sees the district’s beautiful landscape in terms of protecting access to places, strengthening local economies and enhancing quality of life in southern Utah. “We fish, we hunt, we ATV, horseback ride, we hike - these are all things my neighbors do right out their backyards,” said Holland, who runs a tour guiding service with her husband, John. But Holland’s “People Come First” agenda might not be persuasive enough to sway voters in a deeply Republican expanse of a deeply Republican state. More than two-thirds of the ballots in the district went to President Donald Trump in the last election. And voters re-elected their controversial House representative Mike Noel, 2-to-1. The House District 73 includes a vast area of southeastern Utah. Another challenge of the district is its size. Five entire counties are included in District 73 — San Juan, Garfield, Kane, Piute and Wayne — and parts of two others — Beaver and Sevier. The area spans about one-fourth of the entire state and equals the states of Vermont, New Hampshire and Rhode Island combined. Swaying political loyalties over such a vast area is a Herculean effort– especially when the district has a tradition of favoring Republicans. That might explain why Lyman isn’t focusing on getting out the word about his legislative campaign. 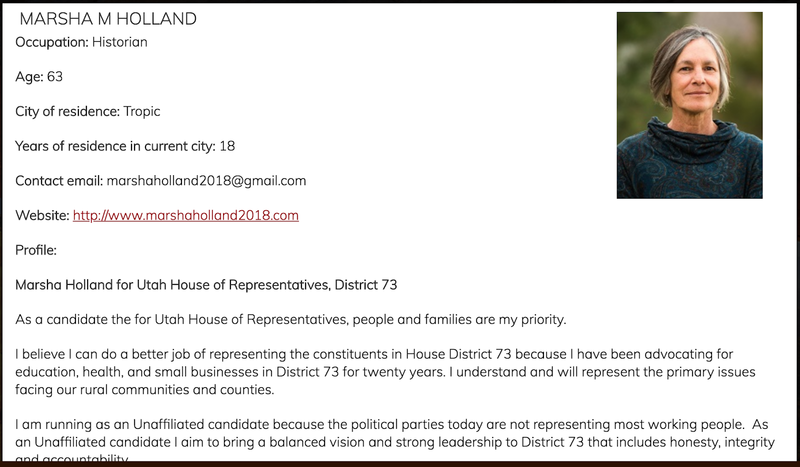 The first page of two pages from Marsha Holland's candidate-information post on the state Elections Office web page. 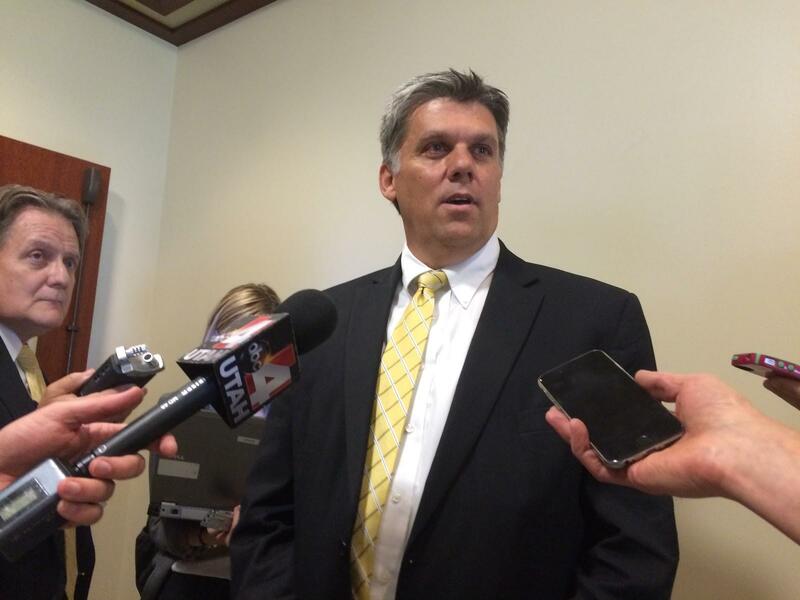 Holland is running unaffiliated with the recognized political parties. More proof of that is their respective on the state candidate’s web page. Holland provided a detailed profile and photo. Lyman’s page, in contrast, is blank. Instead, he touts endorsements from fellow county commissioners and the lawmaker he hopes to replace. Yet, Lyman is actually the underdog in this legislative contest when it comes to funding. The most recent state campaign reports show he’s raised under $10,000. Holland, meanwhile, has raised about $38,000 in contributions. 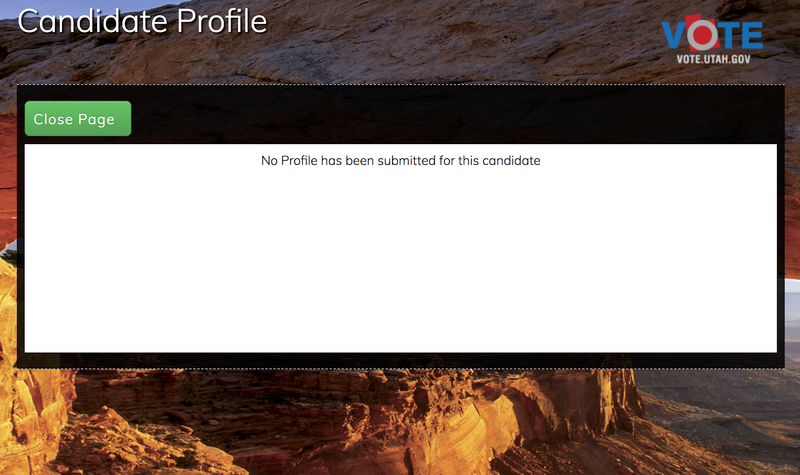 Republican San Juan County Commissioner Phil Lyman's candidate page on the state election website is blank. Lyman’s big campaign advantage is name recognition. He was in the news a lot because of his federal trial for organizing and leading an ATV protest in 2014. Lyman organized the protest and was one of the dozens of people who rode ATVs into Recapture Canyon, which had been closed to motorized vehicles by the U.S. Bureau of Land Management to protect archaeological sites. Lyman served 10 days in jail and was ordered to pay $96,000 in restitution. His appeal failed. Lyman describes himself as a target of the media, environmental groups and the courts. His criminal conviction remains a flashpoint in the West’s culture wars. In some ways, that makes him a disruptor like Trump. “Even though it may be maybe the reputation is undeserved, to some extent, in my district, it's appreciated,” he said. Lyman’s main cause is challenging what he calls government abuse of power. With about 66 percent of the land in Utah being federally owned, government “overreach” tends to dominate Utah’s GOP-dominated politics. And House District 73 could be described as Exhibit A for that issue because of objections to the Bears Ears and Grand Staircase Escalante national monuments, which both lie within the district boundaries. Lyman described the fight as a calling. Lyman was at the witness table in a Capitol hearing room recently when Mike Noel addressed the candidate directly. “Commissioner Lyman’s going to take my seat up here, place up here, and he’ll do an astounding job,” said Noel, who’s been a leader in the fight against the federal government during his time in the Legislature. San Juan County Commissioner Phil Lyman talks to reporters while state leaders talk behind closed doors about helping to cover costs in his federal court case. In the end, lawmakers decided against it. Holland is not deterred. Her name and ideas are getting noticed. She received a mention in a recent New Yorker magazine article about the area’s public lands fight. And, while some people have told her they’re voting Republican and turned her away when she’s gone door-to-door, she’s also met some voters who are excited about a candidate who is pledging to focus on more immediate needs of addressing the region’s growth. So, she’s letting voters know who she is – even if she’s encountered some hazards along the way. “I've gotten four dog bites and one plane crash under my belt,” she said. Two of the dog bites happened on her first day. And the plane crash occurred when she was in a private plane that snagged a fence upon landing in Monument Valley. She didn’t see why a few bruises and a cut should make her miss another chance to meet voters, so she went to the event. It was a dirt floor in a tent on the Navajo reservation, and Holland got to right to work, undaunted by the larger challenge of winning a legislative seat in such a big district so set in its GOP ways. SALT LAKE CITY (AP) — Phil Lyman, a rural county commissioner who became a cause celebre in the movement challenging U.S. management of Western public lands when he led an all-terrain vehicle protest ride in 2014, said Tuesday he is running for the Utah Legislature. 10/24/17 9:43 a.m. -- There's more information today on this story. See the end of this post. A federal appeals court on Monday affirmed the convictions of two men who organized an ATV protest into closed parts of Recapture Canyon.